While agreeing with Nick Dowson (NI 497) when he states that a basic income should not be an excuse for a shift from services provided by the state, there is clearly a need for a change from the current bureaucratic and inflexible benefits system. Instead of the demeaning process of a fortnightly registration and interrogation process with sanctions forcing people to foodbanks and debt, it should be simpler for people to receive a minimum income when in between jobs, working part-time or starting up a business. 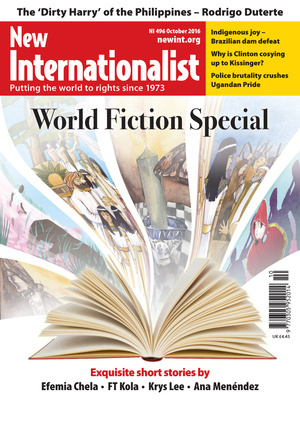 I’m writing to say that I’m loving the World Fiction Special (NI 496). After about 23 years of subscribing, this is such an enjoyable ‘change of pace’. What a great idea. I hope it can be done again before another 23 years escapes us. I was very unhappy to receive a magazine full of short stories (NI 496) in place of the excellent issue coverage for which I subscribe to the publication. I am sure that the writers are enormously talented, but short stories are not of interest to me, and so this month’s subscription money was wasted. 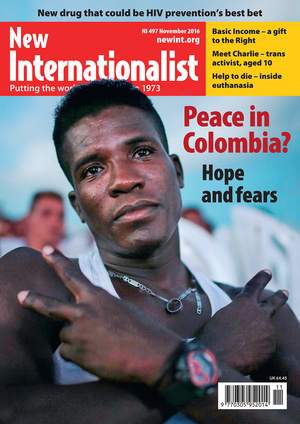 This was not the product I was sold – ‘in depth coverage of global issues’ – and I feel that I have been cheated. It is arguably a breach of the UK Trade Descriptions Act. I hope that this will not be repeated in a future edition. Thank you for your recent fiction issue. I love it when the usual format is put aside to do something different. But what I intended writing about was the sometimes ‘fictional’ perception of Australia where I live. If China or Russia were holding 1,800 innocent people hostage on two prison islands, the world would know about it. Because it is Australia, people cannot reconcile it with what they know – a sunny and friendly ‘Western’ country in the South Pacific – and so dismiss it. Cognitive dissonance, I think they call it. But Australia, with no Bill of Rights or Human Rights Act to enforce the rights of the most vulnerable (often indigenous people here) is indeed keeping people in conditions rightly described by the UN as amounting to torture, indefinitely held in dangerous conditions. The world must be made aware of the human rights abuses happening here, and people outside Australia, please make a fuss: 1,800 hostages, whose ‘crime’ was to try to get here by boat, some of the most vulnerable but bravest people in the world, are being driven to suicide with mental anguish, in a mainly hostile local population. This is not to mention the archipelago of gulags across Australia, housing another 2,000 refugees, and then the 30,000 or so people on ‘bridging visas’, in limbo for years, as the Department of Immigration and Border Protection exercises its go-slow policy.